Opera House in Geneva, New York, May 21, 1920. Many thanks to the Northern New York Library Network and their New York State HistoricNewspapers site. 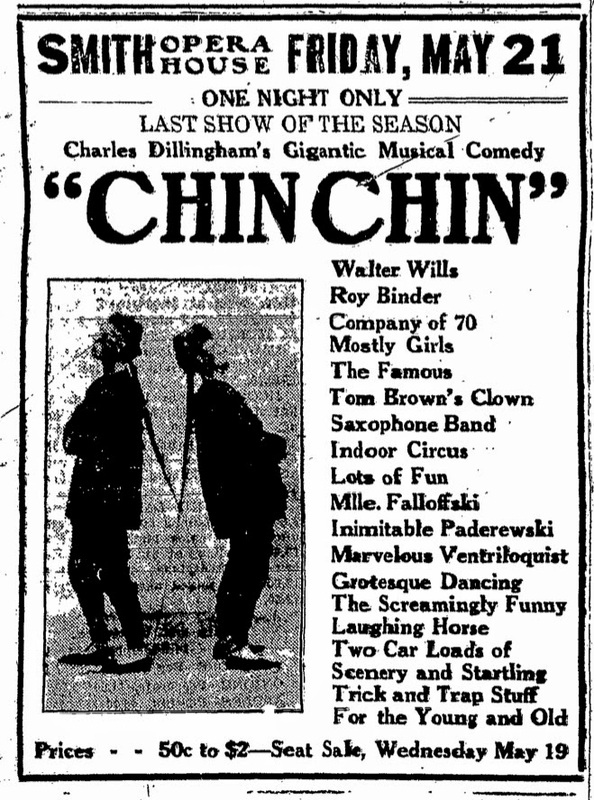 Because of their efforts, I learned that “Chin Chin” played in at the Smith Opera House in Geneva, New York on 21 May 1920. This was probably one of the last shows of the Chin Chin company and the last one that I have found so far. This was a one night show so the pre-show advertising was very important. The initial ad for the show, which ran on May 15th, contained more detail than the show’s advertising typically had. It informed the reader that “Chin Chin” was a company of 70, mostly girls, the famous saxophone band, Mlle. Falloffski, grotesque dancing two car loads of scenery and much more. (I’ve always wondered what “grotesque dancing” was.) There was a more standard “Chin Chin” ad on the 17th. Articles apparently provided by the “Chin Chin” publicist were published on May 19th and 20th. Neither had any mention of Donna. Built in 1894 by William Smith, the Smith Opera House operated as the premier theater in the area for opera and vaudeville. Originally, it seated about 984 people, 425 on the floor level, 203 in the balcony, 300 in the gallery, and another 56 in the box seats. [i] The stage was relatively small, only 32 x 22 feet. As more and more of the theater’s engagements were movies, the theater switched to entirely movies in 1929. In 1931 the theater was converted to a 1400 seat movie theater. The theater continued a long decline and finally closed in the mid 1970s. 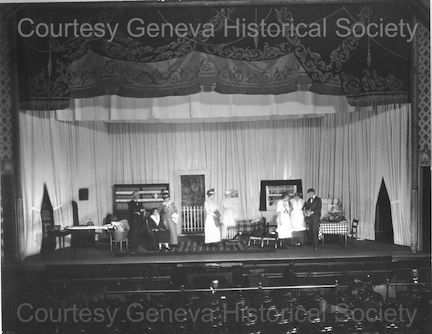 In 1978 the theater was taken over by the City of Geneva. They worked with the Finger Lakes Regional Arts Council to preserve and restore the theater to its previous grandeur. 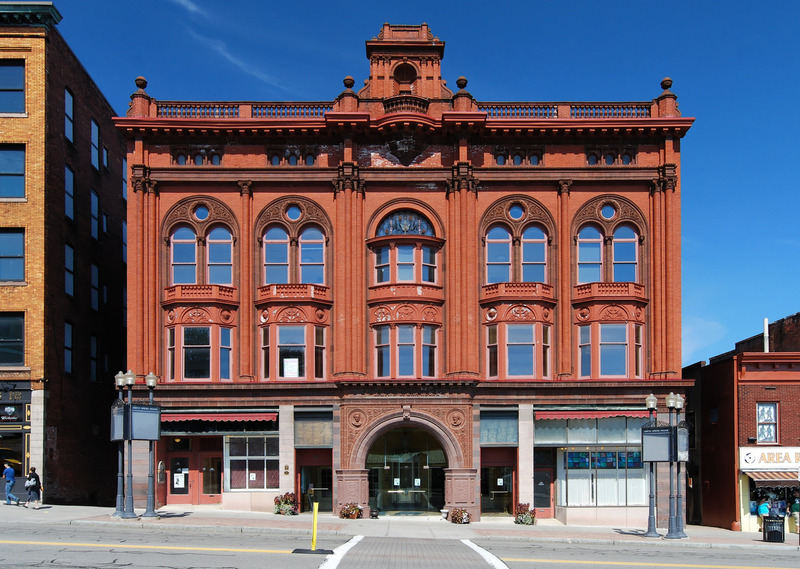 In 2008 Finger Lakes council teamed with the Geneva Arts Development Council to change the focus of the facility and renamed the theater, Smith Center for the Arts.